In addition to the documents below, additional strategy information can be found in the navigation on the left. 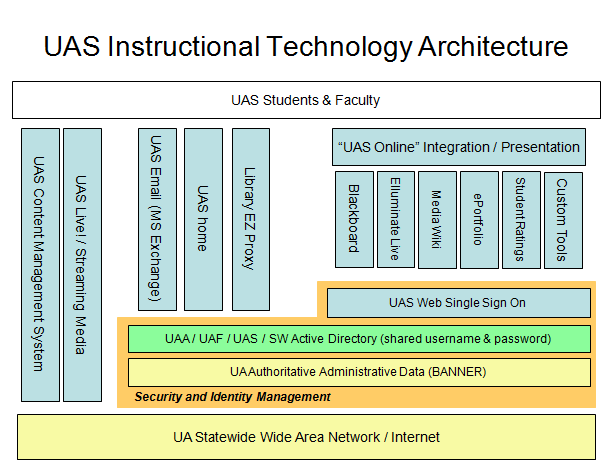 This diagram illustrates the overall enterprise architecture for instructional technology at UAS. The diagram illustrates the relationship between the data network, UA ERP (Banner), UA Unified Directory (AD), UAS Web Single Sign-On (SSO), and the various services that are used for instruction and research. This document summarizes the formal groups that contribute to UAS IT Governance. This document summarizes the critical times of year for the different stakeholder groups. The intended purpose is to use this document in IT planning to better understand the impact of projects on the UAS community. This document lists the type of positions available in UAS ITS, their job families, comparability to other positions, and possible career ladders. This report analysis course web site activity for UAS Fall 2012 lecture courses using the metric of "student persistence" throughout the semester. This provides four examples of collaborative technology development at UAS The document was created a part of the 2009 re-accreditation self-study. This planning matrix describes the overall "UAS Online" strategy. The matrix shows the instructional technology features (services ) needed and the systems that are leveraged to provide them. This document summarizes the web course management features that are available, broken down into those that are "universal" to all courses and those that can be configured by faculty or students. This report was drafted at he request of the Chancellor in 2008. It summarizes the concept of Enterprise Architecture (EA), evaluates EA at UAS, and provides several sample EA artifacts.